Yes, you have free access to the full text of more than 50 publications, using the familiar interface common to PubMed and other Entrez resources! When the Bookshelf first became available from NCBI, the textbooks in its collection were almost exclusively from the fields of molecular and cell biology. However, this is no longer the case. The Bookshelf now features 59 “books,” but this number greatly underestimates the number and scope of materials. One “book” is the entire HSTAT (Health Services/Technology Assessment Text) collection, itself containing over 100 AHRQ Evidence Reports, AHCPR Supported Clinical Practice Guidelines, the Guide to Clinical Preventive Services, and more. 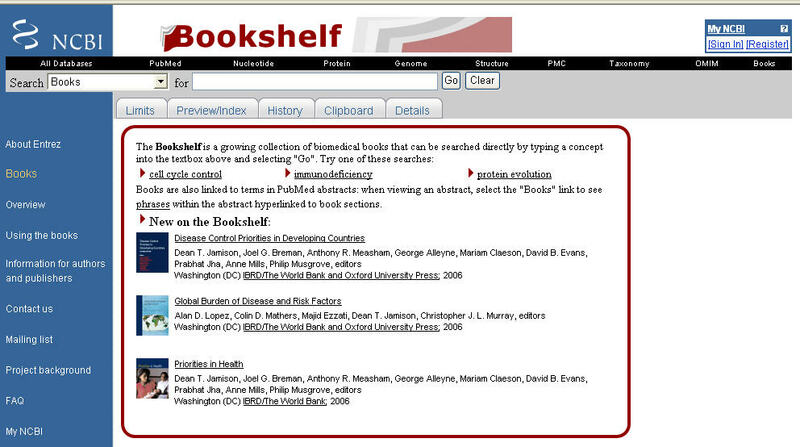 The Bookshelf provides access to a growing number of clinical texts (e.g., Spinal Cord Medicine: Principles and Practice; Parkinson’s Disease: Diagnosis and Clinical Management; Polymicrobial Diseases) and is very strong in public health (e.g., Priorities in Health; Global Burden of Disease and Risk Factors; Health United States). From the PubMed homepage (http://pubmed.gov) you can click on Books from the black bar of Entrez databases across the top, or go the Bookshelf directly at http://www.ncbi.nlm.nih.gov/entrez/query.fcgi?db=Books. On this homepage you will find the familiar Entrez search box where you can enter a simple or complex query. The default is to search for your topic in all books on the Bookshelf. The Limits tab is very useful. Rather than publication types and subsets as in PubMed, Limits in the Bookshelf provides a handy way to “limit” your search to a particular book or books, to information in figures or tables, or to materials by a specific author. Alternatively, on the Bookshelf homepage, click a book thumbnail (icon) for more detailed contents of that resource and an optional search box. Additional background and an overview of search steps are available at http://www.ncbi.nlm.nih.gov/entrez/query/Books.live/Help/bookover.html. Or, see illustrated step-by-step search examples at http://www.ncbi.nlm.nih.gov/entrez/query/Books.live/Help/bookhelp.html#search.